The 6800 series combines an attractive ergonomic design with "always-on" reliability and secure encrypted communications. The phones deliver advanced IP telephony features and wideband audio capabilities with an easy-to-use, full-featured voice communications experience on third-party hosted call control. The line keys on each model are fully programmable. You can set up keys to support either lines, such as directory numbers, or call features, such as speed dialing. You can also boost productivity by handling multiple calls for each directory number, using the multiple-calls-per-line appearance feature. Tricolor LEDs on the line keys support this feature and make the phone simpler to use. Fixed function keys on all models give you one-touch access to service, messaging, directory, hold/resume, transfer, and conference features. A full-duplex speakerphone lets you set up clear multiparty conferences for flexible, productive collaboration. 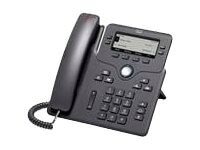 The Cisco IP Phone 6800 series maintains the same usability standards and context-sensitive user experience as the Cisco IP Phone 7800 series. The 6851 IP phone features a high-resolution 3.5-inch (396 x 162-pixel) grayscale display with white backlighting for easy reading. Localized language support, including right-to-left onscreen text, meets the needs of global users. The IP Phone 6800 series is ideal for businesses that want to update their phone system from a traditional analog or digital-based system to an IP communications system with third-party hosted call control services.